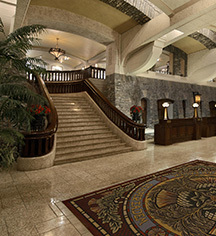 Fairmont Banff Springs is the luxury stop in the heart of Banff National Park, a UNESCO World Heritage Site. Built by the Canadian Pacific Railway to pursue a grand vision of opening up the Canadian west to tourists, Fairmont Banff Springs has had over 100 years of providing a sophisticated resort experience. Nicknamed the "Castle in the Rockies," this hotel has provided guests with an incomparable access to the beauty of the Canadian mountainside and all it has to offer. Boasting 764 guestrooms, the Fairmont Banff Springs offers over 20 different room types, hypo-allergenic bedding, satellite television, video game consoles, luxury toiletries, a spa, fitness center, and childcare. The grounds feature a championship golf course, tennis courts, bowling, skiing, and authentic local cuisine for an immersive resort experience. With over 34 meeting and event spaces, it is the premier Canadian location for conferences and meetings, as well as fairytale weddings. The guest experience is complete with several restaurants and shopping on-site, plus tours of the historic location. For those wishing to explore the area around the hotel, exciting options such as snowshoeing, local museums, tours of the ice canyons, and helicopter rides are just some of the options. Fine dining establishments with regional cuisine are plenty and winter adventures such as dog sled rides, ice fishing, ice climbing, white water rafting, and horseback riding are just a taste of what is available. The Fairmont Banff Springs’ location, nestled in the Canadian Rocky Mountains, provides more than enough cultural entertainment and activity to fill several trips. Fairmont Banff Springs, a member of Historic Hotels Worldwide since 2018, dates back to 1888. In 1953, Marilyn Monroe stayed at the Fairmont Banff Springs during the filming of the movie River of No Return in Banff National Park. While filming, she sprained her ankle. It is said that each morning the bellmen would draw straws to decide who would be the lucky one to bring Ms. Monroe down in a wheelchair to her waiting chauffeured car. ATM: Multiple ATMs are located on-site. Cancellation Policy: Cancellations must be made at least 30 days prior to arrival. Hotel/Resort Fees & Taxes: There is a resort fee is $25 CAD per accommodation, per night, 5% GST, and additional gratuities. Parking: On-site and valet parking are available; there is a surcharge for both. Pet Policy: $50 CAD per pet, per accommodation, per day. There is a maximum of two pets per room. Shuttle Service: Shuttle service to and from local destinations is available (surcharge). 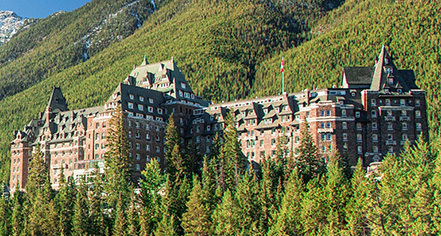 Learn more about the History of Fairmont Banff Springs .